Australia’s dairy industry is set to tackle some of the biggest issues facing the sector head-on at the Australian Dairy Conference (ADC) in Canberra next February 19-21. A bold and strong agenda focusing on leadership, antibiotic use, bobby calves, genetics and dairy diet wars is set to bring contentious debate as the nation’s dairy industry equips itself to tackle issues trending into the future. Experts from around the globe have been garnered for their independent perspective to shine light on where the Australian industry is placed, how well it is positioned for the future and to impart key learning’s from global best practice. 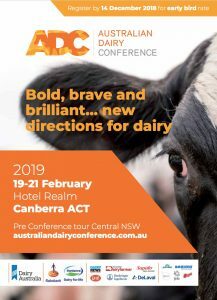 ADC 2019 Programming Chair Susan Wearden said that the program line-up is specifically tailored around the issues having most impact on the dairy industry now and into the future. “Strong leadership is critical to this endeavour and hence ADC 2019 kicks off with prominent leader perspectives before knuckling down into societal trends, on-farm applications and broader industry impacts,” said Susan. “As an industry rather than shy away from these issues we are going to explore, debate and discuss so that the best outcome can be achieved moving forward,” she said. “The focus of this year’s program is to really challenge thinking about what we do on and off the farm, why we do it, question whether we can we do it better, and explore what impacts do my actions have on the broader industry. “There is a posed line of thought for the entire dairy spectrum in the 2019 program ranging from dairy farmers, processors, leaders and service providers and an opportunity for them to be at the forefront of sustainable best practice,” said Mrs Wearden. Bold leadership– insights and perspective from Dr Brendan Nelson (former Defence Minister and curator Australian War Memorial), political scientist and commentator Peter van Onselen and Dairy Australia Managing Director Dr Dave Nation. New frontiers in the diet wars– how real is the threat, how alternative are alternative milks and the value of speaking the consumer language including Dr Judith Bryans (International Dairy Federation President & Chief Executive Dairy UK), Dr Anneline Padayachee (Simple Scientist), Melissa Clark Reynolds (Beef and Lamb NZ) and Melissa Cameron (Dairy Australia). Insight into the world of milk processing– Rabobank’s Mary Ledman shows a global example of a processor and supply base with mutual respect before a panel of executives from five competitive dairy companies take to the stage hosted by Rabobank’s Michael Harvey. High tech dairy farming– genomics, productivity gains via genetic data and farming from our phones including Australia’s best dairy farm apps including Professor Andrew Cromie (Irish Cattle Breeding Federation), Brad Nosbush (US dairyfarmer) and Victorian dairy farmers Jared Ireland and John Pekin. Dairy Elders– Irish expert Dr Nollaig Heffernan talks about the Australian quality of resilience whilst journalist and broadcaster Virginia Haussegger interviews three dairy hero women sharing their stories of resilience, strength, endurance and wisdom to close the conference. See ADC Program for more information regarding ADC Canberra 2019. Register now for ADC Canberra 2019.